Don’t let the low score of 13-3 deceive you. Super Bowl LIII in Atlanta this past Sunday was one for the record books. It’s just the defense that was historic and their glory came at the expense of the league’s second-ranked offense this past season. The Patriots defense was humiliated in last year’s Super Bowl LII and it became apparent early on that they were looking for redemption against the Rams and their much-vaunted offense. Like innocent lambs before the slaughter, the Rams clearly had no idea of the fate that awaited them. Not to rub salt in the still-open wounds from Sunday, but here are just a few of the low points. No team has scored more points over the last two seasons than the Rams, yet on Sunday they couldn’t even cross the Patriots’ 20-yard line, much less cross the goal line. As a result, they tied the 1971 Dolphins for the fewest points scored in a Super Bowl. Of the 60 offensive plays run by the boys in blue and gold, a full 27 (or 45%) went for zero or negative yards. They had only 57 yards in the first half. Just about the only positive note from the game is that Rams kicker Johnny Hekker set the record for the longest punt in a Super Bowl with his 65-yard kick in the third quarter. Too bad the team also netted a record eight straight punts from Hekker as well. Third-year Rams QB Jared Goff looked as if he was overwhelmed by the moment. Whether it was the deer-in-the-headlight look during the National Anthem or the uncontrollable piston-like up-and-down motion of his right knee on the bench, the regular season phenom was a shell of his former self on Sunday. The one chance he had to score a touchdown with a wide open Brandin Cooks in the back of the end zone, the ball was swatted away because Goff hesitated and was late on the release. RB Todd Gurley, heralded by some as a potential offensive MVP earlier in the season, had ten carries for 35 yards. And speaking of Gurley, what are we to make of his disappearance in the playoffs? Coming out of college there were some scouts who said that his knee had a shelf life of five to six years. As if you needed more salt, Gurley has been in the league how many years now? While many will look upon this game as a sign that head coach Sean McVay, Goff, Gurley, and crew were just another flash in the football pan, the truth is they just had the unfortunate fate of running into an experienced Patriots team on a mission. 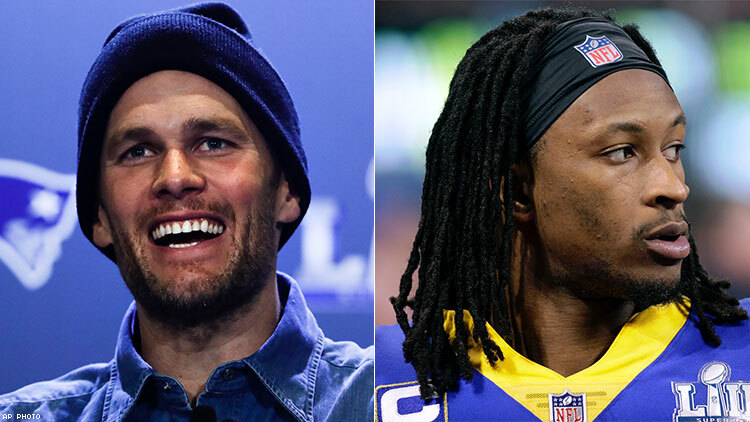 Right now the Rams players are devastated from the loss on Sunday, but the Patriots have endured that same experience three times before. In part, it’s because the Patriots know what it feels like to lose that they know what it takes to win the game’s ultimate prize six times and counting. The Patriots mixed and disguised their coverages in the secondary. Their defensive front stunted, blitzed, and sacked Goff four times. Their defensive backs blanketed receivers and came up with the big plays when it counted. It was a display of dominance not seen before on this stage. As much as you want to blame the Rams offense for that loss, you should rightly give credit to the Patriots defense for the win. You may love them or hate them, call them cheaters or unfairly singled out for punishment. No matter what you may think, though, the truth is that the Patriots have earned the right to be recognized as the greatest dynasty in football. Rightly or wrongly, greatness is measured by rings. The Patriots have been to nine of the last 18 Super Bowls and have won six of them. That simply does not happen by accident. The parts may change around them, but Brady, team owner Robert Kraft, and head coach Bill Belichick have perfected a system that allows them to reload instead of rebuild season after season. People should take a step back and not just acknowledge but appreciate the greatness of the Patriots while they are still around mopping up the rest of the league every third year.